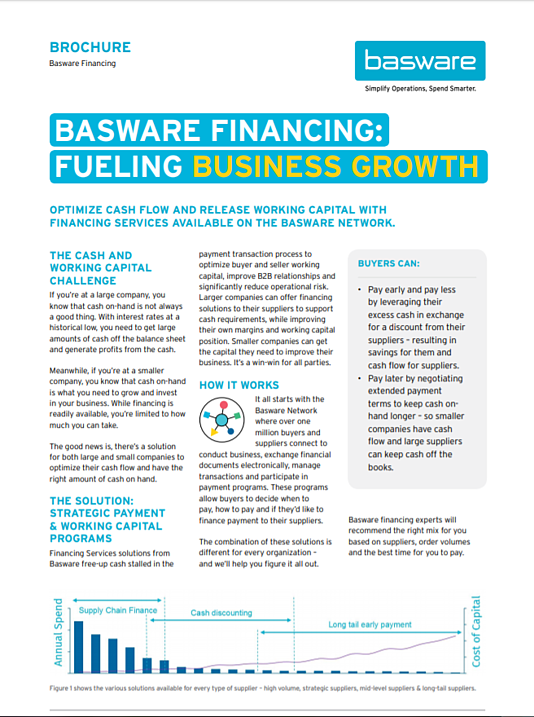 Optimize Cash Flow and Release Working Capital with Financing Services Available on the Basware Network. In a recent Basware survey 82% of suppliers would see tangible benefits if their customers paid invoices on time. 69% of businesses have a clearly stated goals to generate value from cash in the bank. 31% agree that paying late limits the growth of the economy. 23% are highly automated to manage invoice payment efficiently. Pay early and pay less by leveraging their excess cash in exchange for a discount from their suppliers – resulting in savings for them and cash flow for suppliers. Pay later by negotiating extended payment terms to keep cash on-hand longer – so smaller companies have cash flow and large suppliers can keep cash off the books.